This post is eventually about strawberry shortcakes, I promise. If you want to skip my rambling just scroll down a bit and you’ll get to the recipe. 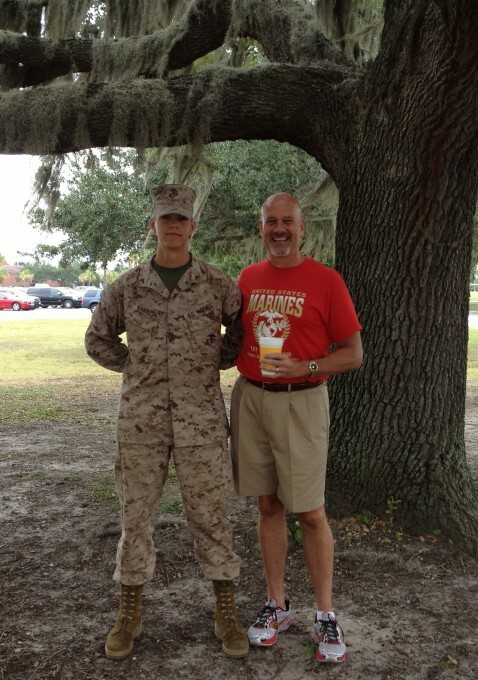 Last year at this time, my youngest son, Casey, was at Marine boot camp at Parris Island. I wrote some thoughts about honoring our military in my post Beyond Apple Pie. This year, he is home and serving in the Marine Reserves. I never wrote about our experience, so I thought I’d share a little now. Let me tell you, if you ever have the opportunity to experience a Marine boot camp graduation—don’t miss it! I will forever count that as one of the top moments of my life. Boot camp lasts for 13 weeks, and it’s a long 13 weeks in the life of the recruit and the family. The night they arrive on the base, they’re allowed one phone call to let you know they have arrived safely. But it’s not a conversational call…and if you’re unprepared, it will tear you apart. They read a short script at the top of their voice, which is already hoarse, and they’re not allowed to say anything else or to respond to anything you say. The whole thing lasts 10-15 seconds and then they hang up. They. Hang. Up. Fortunately, I was prepared but I still cried like a baby after that phone call. And that’s the last time I heard my baby’s voice for 13 weeks. It was tough. The recruits don’t have a lot of letter writing time—I got one per week—and no phone calls. For the first couple of weeks, you don’t hear anything except a form letter giving you the recruit’s address. I wrote to Casey every day, and numbered each letter in case he got several at one time. We had a matrix of the schedule posted on our fridge, which helped because we always had some idea of what he was doing. The last activity prior to graduation week is The Crucible, a 54-hour test of endurance and intestinal fortitude. Some parents get a phone call after the Crucible since the Marines get liberty on Sunday afternoon. I didn’t get a phone call because we thought it would be harder if we were able to talk and the lines to use a phone are extremely long. But, as you learn the day your recruit leaves for boot camp, no news is good news, and I knew when I hadn’t heard from anyone by Sunday evening that he had made it through the Crucible and we were good to go. Our graduation week activities began on Wednesday with Family Day orientation. Initially it was just David, Brian and me since Malorie couldn’t get there until Thursday evening. Families register and attend informational presentations. When we registered and found the list of names for our Marine’s platoon, we learned that he was one of two from his platoon who had earned a meritorious promotion during boot camp. He had never told us, and you cannot begin to imagine how proud we were. The three of us were beaming all day. It still makes me tear up just to remember that moment. We didn’t get to see Casey on Wednesday. The first time you’re allowed to see your new Marine is on Thursday. The day begins with the Motivational Run at 7:00 a.m. I didn’t want to be late or have to worry about parking, so we arrived on the base about 5:30. The first sight of the graduates was in the dark and all you could see were their reflectors. 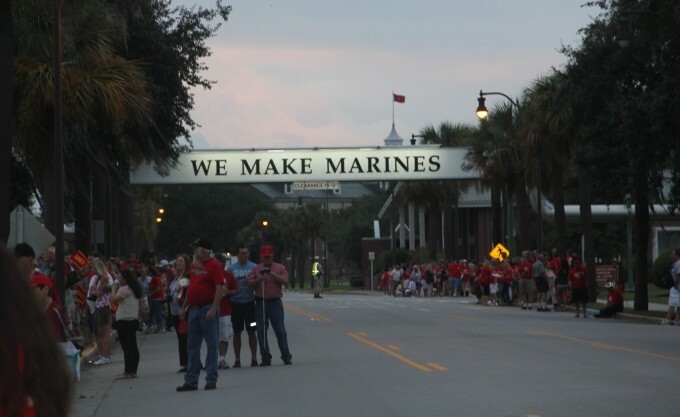 Parris Island is a place that makes you proud to be an American, and especially proud to be a family member of a United States Marine. They are proud of what they do and rightfully so. The greatest fighting force on this earth is created right there on that tiny little island off the coast of South Carolina. It still gives me goosebumps to look at that sign. Nothing fancy, no long pronouncements or propaganda. Just WE MAKE MARINES. Boom. Take that, Taliban. 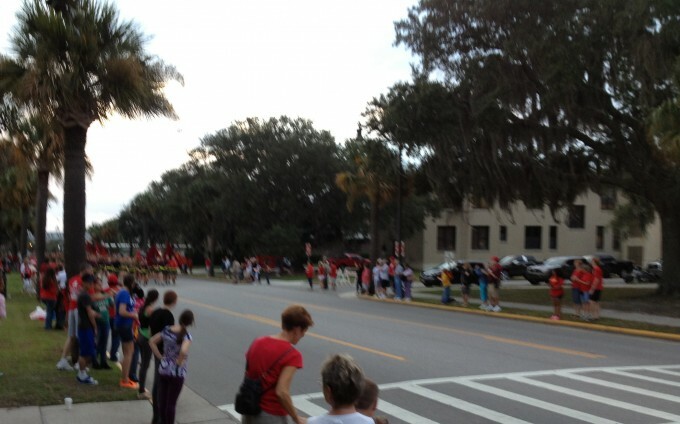 Pretty soon we could see the platoons coming down the street. Our first glimpse was from far away and we had no idea which one was Casey. 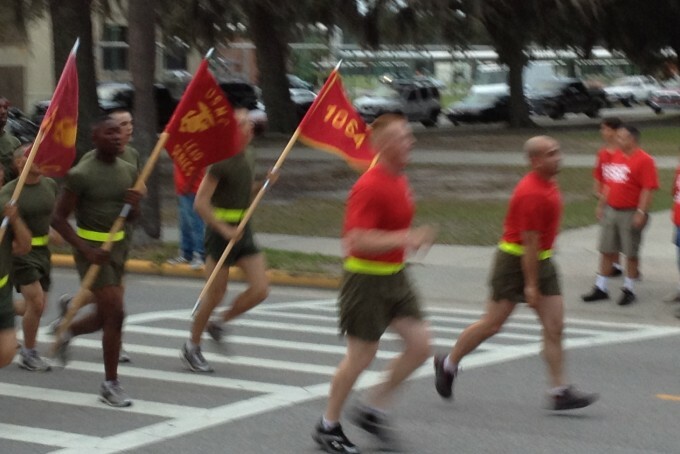 And then our next surprise…he ran by carrying his 1064 platoon flag! We didn’t know that was going to happen, and we almost missed him because we were looking into the crowd of Marines and not right at the front. There were a few presentations and then liberty began at 10:00 a.m. I was so happy to give that boy a hug! We were the proudest parents there. Everybody says that but I know it’s true! And the next order of business was food…his favorite chocolate pizza was waiting in the car. We were able to spend a few hours with him and then he had to return to duty and we left to get some sleep before another early morning for the graduation ceremonies the next day. The stands were packed…lots of proud family members and friends. 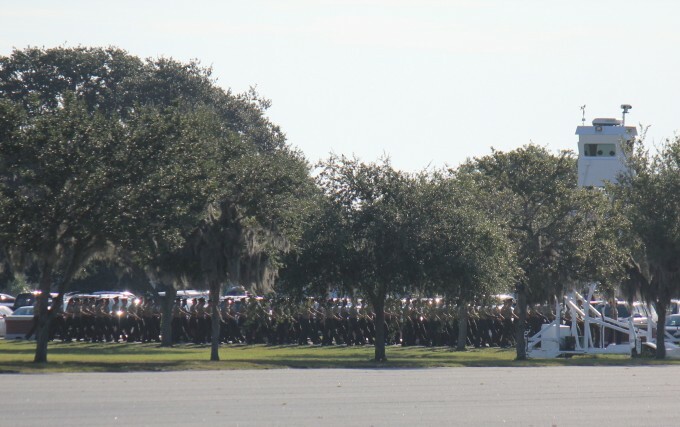 And then we got our first look at the newest Marines as they marched toward the parade deck. We sat right beside where Casey’s platoon would stand, so we were able to have a great view of him and the whole ceremony. He is standing next to the Honor Graduate (the one holding the flag) on the front row. 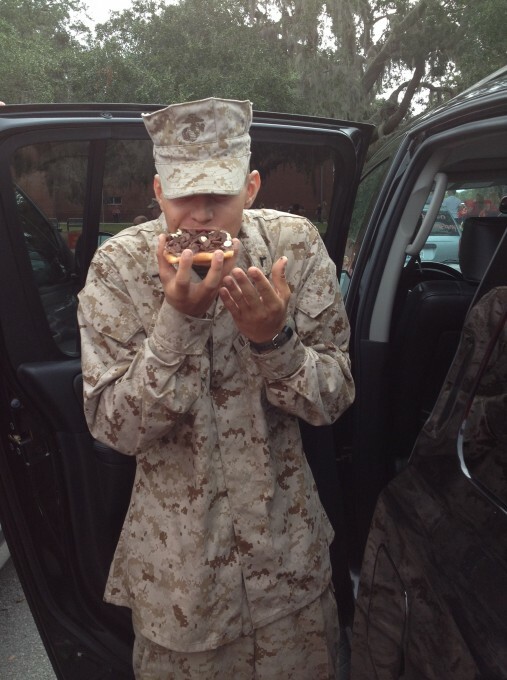 Casey had been designated a Squad Leader just a few weeks after he arrived at boot camp, and he held the position the rest of the time he was there—which is a bit of an unusual feat for recruits at Parris Island. The ceremony only lasted an hour…and when the Marines say an hour, that’s exactly what they mean. Here is Casey’s favorite moment: DISMISSED! OORAH! With an 8 year commitment to the Marine Reserves, he has a long road ahead of him. 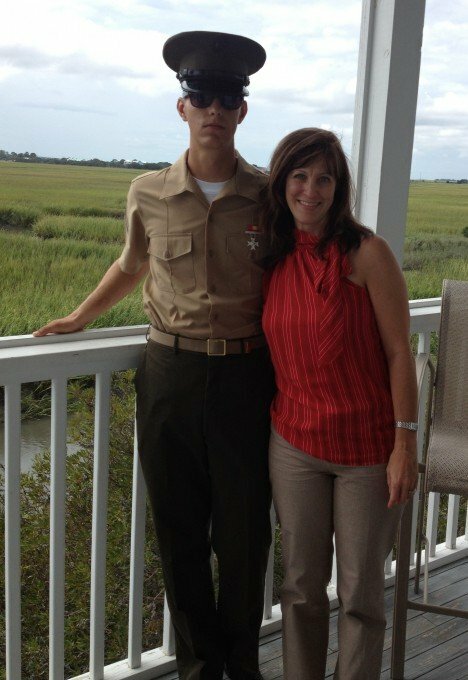 After Parris Island, he spent a few months of additional training elsewhere but is home now and ready to start college like the rest of his friends—while fulfilling his obligations to the Marines once a month and during the summer. He is doing great and he is our family’s hero. He doesn’t like us to say that, because he hasn’t deployed or fought anywhere or, in his mind, done anything of note. But to us, the fact that he volunteered, committed himself for 8 years and is willing to deploy at any moment that he is called makes him our hero—whether he likes it or not! We are so proud of him. 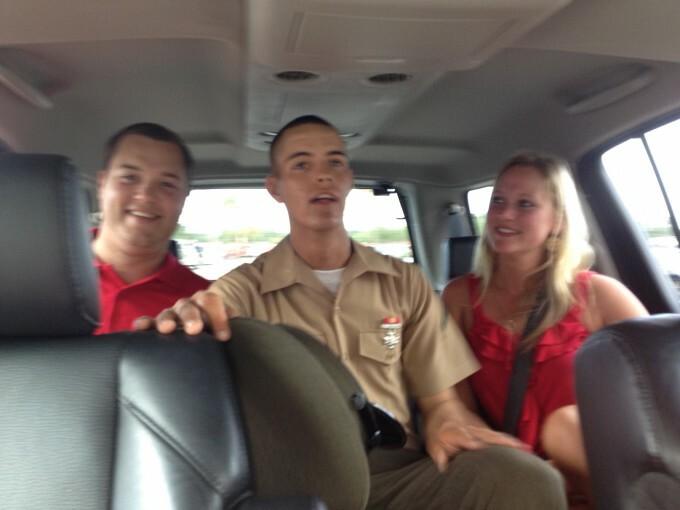 Of course, that didn’t stop his older brother and sister from making him sit in the middle when we drove away from Parris Island. He might be a Marine, but he’ll always be the baby brother. But have you ever seen a prouder big brother and sister? 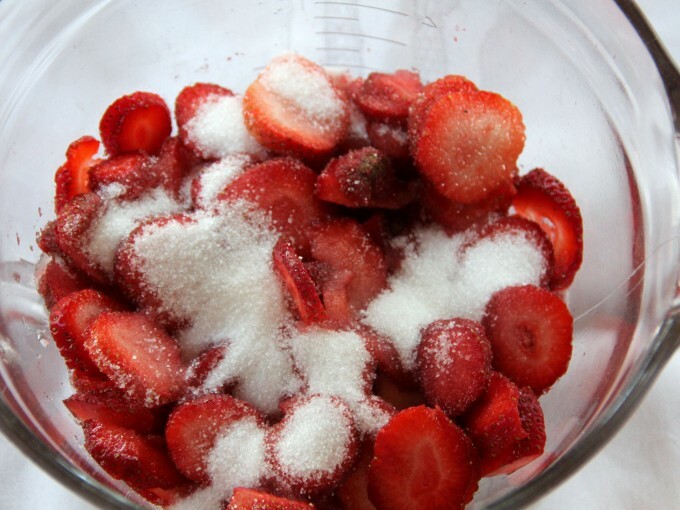 Start with good, fresh sliced strawberries and add a little sugar. If they’re summer strawberries they won’t need a lot of sugar, maybe 1/4 cup. Stir in the sugar and let the strawberries set while you make the shortcakes. The sugar will macerate the berries and draw out the juices. I like to make shortcakes the same way I make biscuits, with just a few slight changes. I use cream instead of buttermilk and add a touch of brown sugar, granulated sugar and vanilla. Sift together the flour, baking powder, salt and sugars into a large bowl. Cut the butter into small pieces and incorporate into flour using your hands or a pastry cutter. Flour and butter mix should resemble small pebbles. Pour in the cream and vanilla and stir everything together until the dough is wet, then keep stirring to catch most of the rest of the flour in the bowl. You will have a stiff dough initially. Turn the dough onto a floured surface, dip your hands in flour and knead the dough gently until it smooths and comes together nicely. This should take 30-45 seconds. Don’t knead too much or you’ll have hockey pucks instead of shortcakes. 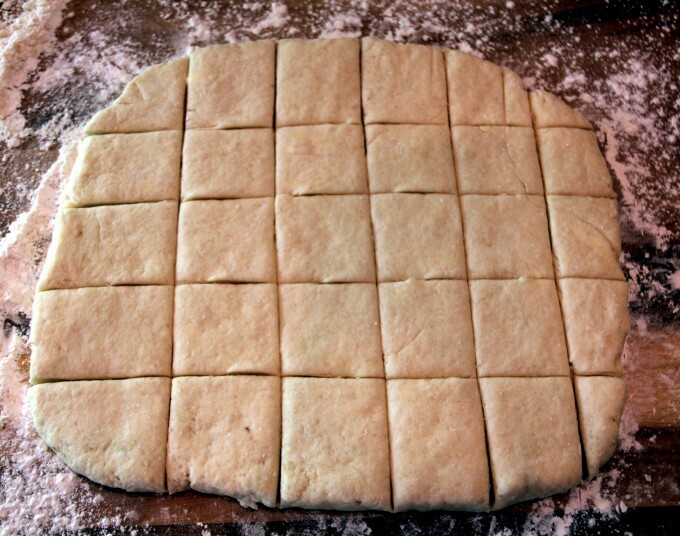 Gently pat the dough into a rectangle about 3/4 to an inch thick and cut into 2×2 squares. Of course, you can make your shortcakes bigger, but I like the 2×2…perfect if you’re trying not to overdo on sweets and if someone wants bigger they can always have two. 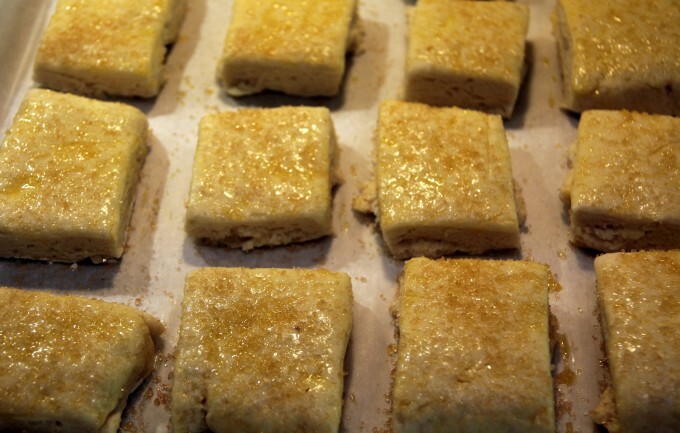 Place the squares on a parchment paper lined cookie sheet, leaving just a little space between each one. Brush the tops with beaten egg and sprinkle with turbinado sugar. Bake for about 10 minutes, until golden brown. Allow to cool on cookie sheet for one minute then remove to wire racks and cool completely. You can also serve warm if you like but they might fall apart a little when you slice them. 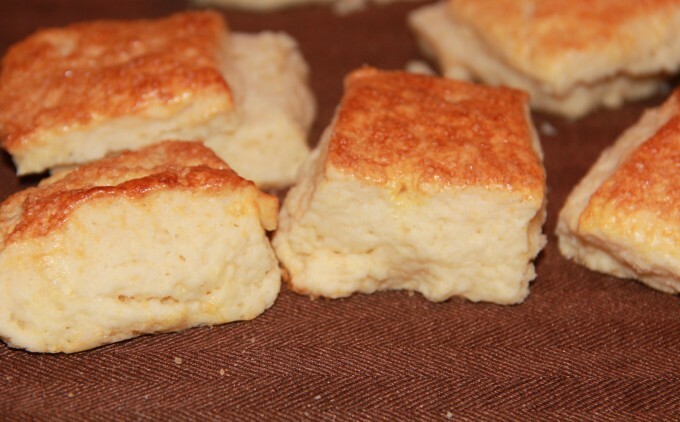 The shortcakes should be nice and fluffy and golden brown on top. Here’s how I put it all together: Slice shortcake and place bottom half in dish. Cover with a scoop or vanilla ice cream and a couple of spoonfuls of strawberries. 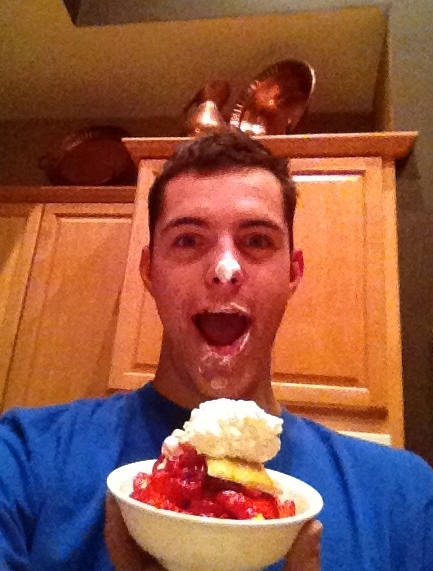 Place top half of shortcake over the strawberries and finish with fresh whipped cream. Enjoy! Lightly sweetened cream biscuits topped with strawberries, whipped cream and vanilla ice cream...heaven on a plate. 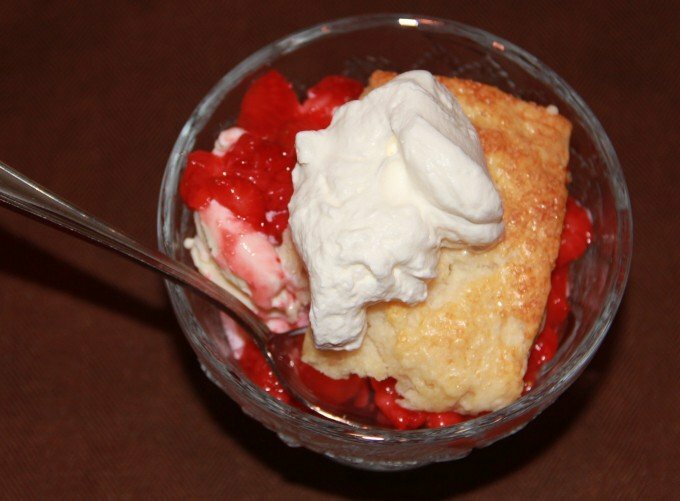 Stir sugar and strawberries together and set aside to macerate while making shortcakes. Preheat oven to 450. Sift together flour, baking powder, salt and sugars. Cut butter into small pieces and incorporate into flour using your hands or a pastry cutter. Flour and butter mix should resemble small pebbles. Stir in cream and vanilla until dough is wet. Continue stirring to get most of the flour incorporated. 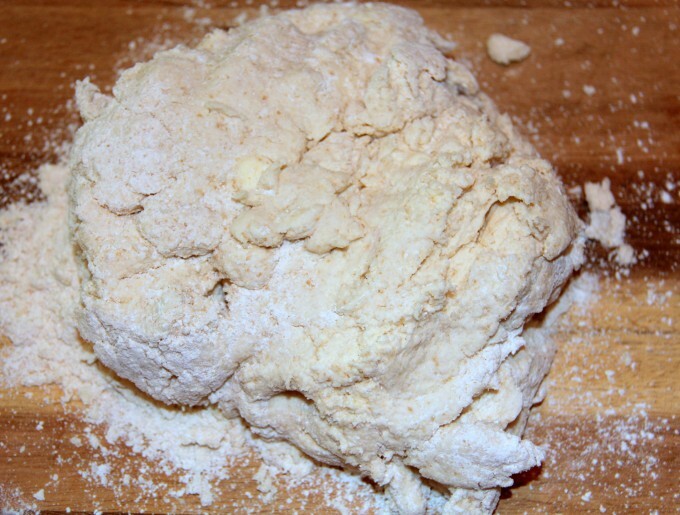 Turn dough onto floured surface. Dip hands in flour and sprinkle just enough on dough to be able to knead it for about 30 seconds. Pat dough into rectangle that is about 3/4 to an inch thick. Using sharp knife, cut into 2x2 squares. Place on parchment lined cookie sheet leaving a little space in between. Brush tops with egg wash and sprinkle raw Turbinado sugar on each one. Bake for about 10 minutes, until golden brown. Cool for one minute on cookie sheet, then remove to wire rack and cool completely. 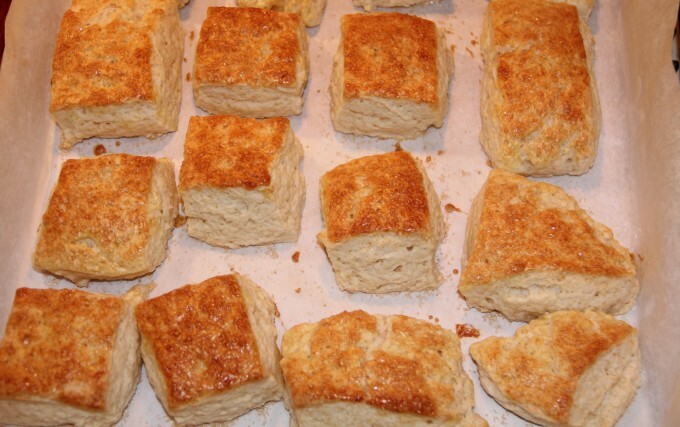 To serve, slice biscuit in half. 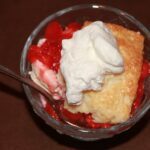 Place bottom in bowl and layer with a scoop or two of vanilla ice cream, then strawberries, then top half of biscuit, then whipped cream. That was simply wonderful! Casey is my hero, too! Thanks, Joanie! Love to you and Happy 4th!